Silverstone and Kwanten are spectacular. Their chemistry is unmistakable and their lines are delivered with precision and emotion, without over-dramatization. Have you ever been in a relationship that you think is over (but maybe, just maybe, it's not) and neither of you wants to admit there are still unresolved feelings and when you do want to, something always gets in the way? Who Gets The Dog? is a romantic comedy that portrays exactly that and brings some humor to an otherwise awkward situation. Who Gets The Dog? is a movie that you'll never get to the end of because you won't want to watch more than the first two minutes - over and over again! The opening scene immediately draws you in. It's a cute, fresh, heartfelt, romantic comedy despite the obvious outcome. I finally had to stop playing back the opening scene so I could watch the whole movie. Olive Greene (Alicia Silverstone, Clueless) and Clay Lonnergan (Ryan Kwanten, True Blood) are soon to be ex- husband and wife. Initially, they seem to be extremely amicable, even apologizing to each other that their marriage didn't work out. But, the pair find one issue that they just can't get past, and an ensuing custody battle occurs - over the dog. Silverstone and Kwanten are spectacular. Their chemistry is unmistakable and their lines are delivered with precision and emotion, without over-dramatization. The individual storylines are concise and easy to follow. The writers were able to emphasize certain personal aspects of self discovery and growth of two people going through a divorce and custody battle, yet they kept the story itself clear. The plot is simple but there is enough detail provided to give it the depth needed to keep a viewer interested. While personal growth of both Olive, a medical doctor, and Clay, a hockey player/coach, are clearly a huge integral factor in this story, it is their relationship with Wesley James, their dog, that fuels their coming of age and realization of what they need and want in life. Watching this couple figure out how to manage custody of Wesley, and get along in the process, is entertaining and humerous. The interactions between Olive, Clay and Wesley are real and not forced. Matt JL Wheeler and Rick Rapozo, the writers, created a very believable and flowing storyline. 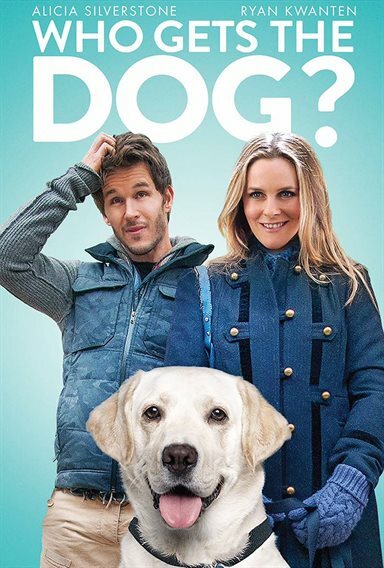 Both Silverstone and Kwanten do a fabulous job of portraying their respective characters, but the real star of the show is Wesley James, the beautiful white dog, that his parents fight over for sole custody. His acting is on point and he adds a depth to the movie that otherwise couldn't exist. There won't be anyone in the theater who doesn't want sole custody of Wesley. Huck Botko directs a simple but deep romantic comedy that deals with real issues. The movie was filmed in Chicago during the winter and the setting is appropriate. While you have to bundle up in the winter to keep warm, it's clear this couple is bundling up their emotions. Be prepared, because there may be some teary eyes iin your home. It's a happy ending that will have everyone walking out with a smile and a fresh outlook on the people, and pets, in their lives. Andrew Dost did a wonderful job with the compositions. The music in the film is light and airy and never overpowers the dialogue. Kudos to Samuel Goldwyn Films and 2DS on a pet loving, human loving story that shows you can work out issues if you just see what's important. Download Who Gets the Dog? from the iTunes Store in Digial HD. For more information about Who Gets the Dog? visit the FlickDirect Movie Database.